It’s easy to get excited about being able to learn more about how your body works. We weren’t exactly born with an instruction manual, but it’s hard to pay attention to all of the subtle nuances that comes with eating, exercise, and sleep. We’ve seen a huge variety of trackers for this and that crop up lately, and some are more successful than others. Our activity levels and being able to effortlessly track what we eat are the most interesting to us, but the thing we often pay the least amount of attention to is how much we sleep. If you had a way to track the quality of your sleep and how much of it you’re getting, it might change how you rest. If that piques your interest, then a tracker like the Withings Aura Sleep Smart System might be useful. The sensor will tuck under your mattress, and will track your movement, room temperature, light, and sound levels. 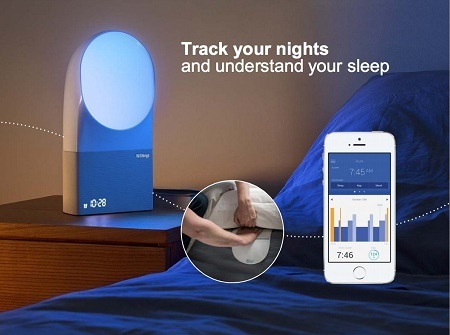 There is a bedside sensor that can help you sleep through light and sound effects. It is also able to wake you up with a sunrise program, help you drift off to sleep with a sunset program, and relax or power nap through specialized programs. You can track your sleep through your smartphone, and should you be sleeping in a bed with two people, you can track both with the purchase of an additional sensor. This setup will cost you $299.99, and would be useful if you can’t seem to figure out why you’re always tired.